Casket bearers were Blaise Ardolf, Chris Anderson, Roy Lea, Tim Ardolf, Pat Hegseth, Gary Widmer, Jack Lano and Mark Simons. Interment was St. Joseph’s Catholic Cemetery in Silver Lake. Paul Conran Ardolf was born Jan. 29, 1924, in Silver Lake, to Frank and Alice (Hoodecheck) Ardolf. He was baptized as an infant and received his first communion and was confirmed in his faith. He attended St. Joseph’s Parish School in Silver Lake, where the examples set by the nuns and a local priest led him toward the priesthood. After attending Silver Lake High School for three years, he transferred to Nazareth Hall to finish high school and complete two years of college, then transferred to the St. Paul Seminary for five years, graduating and becoming ordained on June 4, 1949, one of a class of 12. He gave his first Solemn Mass at the Church of St. Joseph in Silver Lake on June 7, 1949. 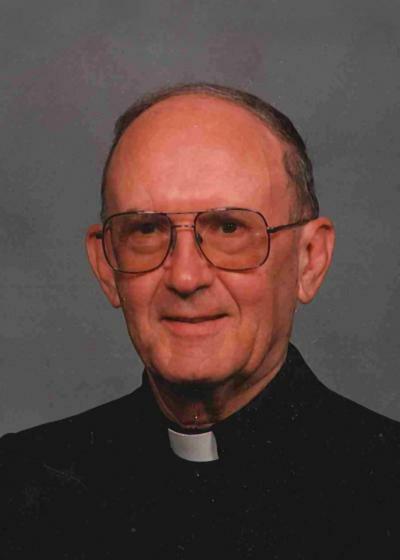 Father Paul Ardolf spent 66 years as a priest of the Archdiocese of St. Paul and Minneapolis, with more than 31 of those at Ascension in Norwood Young America, the parish he called “family.” His first assignment was as an associate pastor at St. Stephen’s Catholic Church in Anoka from 1949 to 1963. Following eight months at Holy Family Church in St. Louis Park, in 1963 he was assigned his own parish, St. Anne’s in Hamel, from 1964 to 1981. From 1981 until 2005, Father Ardolf guided the spiritual life of the Church of Ascension in Norwood Young America. After his retirement, he continued to live in the rectory at the Church of Ascension and to serve as a priest there and at nearby St. Bernard Catholic Church in Cologne. Due to failing health, he celebrated his last Mass at the Church of the Ascension in February 2013 and moved to the Leo C. Byrne Residence for priests in St. Paul. The church was Father Ardolf’s family and he loved spending time with and helping anyone in need. He had a quick wit and a dry sense of humor. He also enjoyed traveling, having visited the Redwood Forest, Germany, and the Vatican in Rome, even meeting the Pope. He is survived by his siblings, Alfred (Nellie) Ardolf of Ludlington, Michigan, Robert Ardolf and his special friend, Nancy, of Edina, and Germaine (Ted) Strycharz of New Smyrna Beach, Florida; sister-in-law, Mary Ann Ardolf of Glencoe; many nieces, nephews, other relatives and friends. He was preceded in death by his parents, Frank and Alice Ardolf; and siblings, Mildred Ardolf, Bernard Ardolf, Donald Ardolf and Gregory Ardolf.